In this animation, the daily Arctic sea ice and seasonal land cover change progress through time, from May 16, 2013 through August 15, 2013. Over the water, Arctic sea ice changes from day to day showing a running 3-day minimum sea ice concentration in the region where the concentration is greater than 15%. The blueish white color of the sea ice is derived from a 3-day running minimum of the AMSR2 89 GHz brightness temperature. Over the terrain, monthly data from the seasonal Blue Marble Next Generation fades slowly from month to month. Early in the month of August, 2012, storms in the Arctic affected the motion of the sea ice north of Siberia and Alaska. This animation shows the motion of the winds over the Arctic in conjunction with seasonal melting of the Arctic sea ice from August 1 through September 13, 2012, when the NASA scientists determined that the sea ice reached its annual minimum extent. The surface winds, shown my moving arrows, are colored by the velocity. Slower winds are shown in blue, medium in green and the fast winds are shown in red. Note: Scientists at the National Snow and Ice Data Center, who calculate the sea ice minimum based on a 5-day trailing average, identified September 16 as the date when the lowest minimum extent occurred. NASA scientists who calculate area on each individual day identified September 13th as the date of the minimum sea ice, although there is little difference in size between the two days. This animation shows the Arctic sea ice melt from August 1 through September 13, 2012, the date on which the ice reached its smallest extent ever recorded in more than three decades of satellite measurements, according to scientists from NASA. The data is from the U.S. Defense Meteorological Satellite Program's Special Sensor Microwave/Imager. Every summer the Arctic ice cap melts down to what scientists call its "minimum" before colder weather builds the ice cover back up. This year the area covered 3.439 million square kilometers, that is down by more than 3.571 million square kilometers from the high of 7.011 million square kilometers measured in 1980. The size of this annual minimum remains in a long-term decline. This visualization shows the annual Arctic sea ice minimum from 1979 to 2012. A semi-transparent graph is overlaid that shows the area in million square kilometers for each year's minimum day. The '1979','2007', and '2012' data points are highlighted on the graph. For high resolution still images of the 1979 and 2012 September sea ice minimum, see animation ID #3998 here. A comparison of the perennial Arctic sea ice and the first-year sea ice in 1980, 2008 and 2012. The sea ice concentration from August 26, 2012 compared to the average sea ice minimum from 1979 through 2010 shown in orange. Arctic sea ice and seasonal land cover change progress through time, from the 2010 minimum which occurred on September 17 through March 16, 2011. Arctic sea ice and seasonal land cover change progress through time, from September 4, 2009 through January 30, 2011. Using five years of data from NASA's Ice, Cloud and land Elevation Satellite (ICESat), a team of NASA and university scientists made the first basin-wide estimate of the thickness and volume of the Arctic Ocean ice cover between 2003 and 2008. This conceptual animation shows a cut-away view of the seasonal advance and retreat of Arctic sea ice, demonstrating the current trend toward a thinning ice pack, with less of the thicker multi-year ice surviving each summer's melt. On Friday August 23, 2013, scientists at NASA's Goddard Space Flight Center talked to television stations from around the country about the Arctic and the changes taking place to sea ice in this region. See below for interviews in English with Tom Wagner and Walt Meier, an interview in Spanish with Carlos del Castillo, and footage and data visualizations of sea ice. Sea ice swirls in ocean currents off the east coast of Greenland on Aug. 17, 2012, as seen by the MODIS instrument on board the Terra satellite. Greenland's ice sheet and outlet glaciers can also be seen at left. Sea ice can take many forms, as seen in this image of Arctic sea ice from the DMS instrument from a recent Operation IceBridge aerial survey. 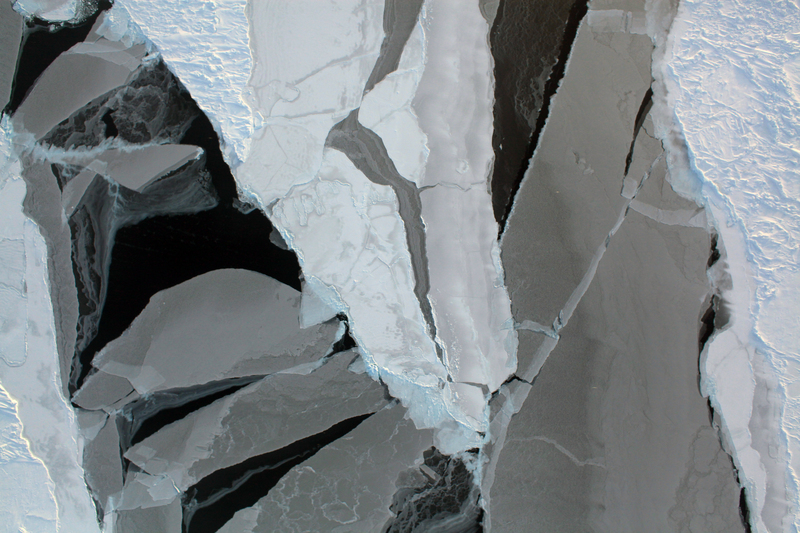 Varying thicknesses of sea ice are shown here, from thin, nearly transparent layers to thicker, older sea ice covered with snow. View from the cockpit of NASA's P-3B aircraft during the Operation IceBridge Arctic 2013 airborne science campaign. A fast-paced interview with NASA climate scientist Tom Wagner, where he provides a look at the state of Arctic sea ice in 2009 and discusses NASA's role in monitoring the cryosphere. For the second straight year, NASA's Operation IceBridge is collaborating with the European Space Agency's CryoVEx program, flying aircraft low over Arctic sea ice while ESA's CryoSat satellite orbits above. This video details the three-decade decline of the Arctic's thick, older sea ice, with seasonal ice not shown and gray circles marking data gaps.